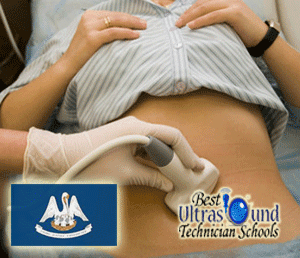 In the state of Louisiana, there are two institutions of higher learning--accredited by the Commission of Accreditation of Allied Health Education Programs (CAAHEP)--that provide ultrasound technician programs. At its School of Allied Health campus in Shreveport, Louisiana State University (LSU), the flagship institution of the Louisiana State University System, offers a Bachelor of Science (B.S.) degree in Cardiopulmonary Science, with emphasis on cardiovascular sonography and respiratory therapy. In addition to CAAHEP, the LSU program is accredited by the Commission on Accreditation for Respiratory Care (CoARC). Delgado Community College (DCC), a two-year public institution located in the New Orleans metro area, has a post-associate certificate (P.A.C.) program in diagnostic medical sonography it offers through its Allied Health division. The LSU curriculum consists of 71 semester credits; the institution requires completion of no less than 60 credits to receive the B.S. degree. Also, it is more focused on respiratory and cardiopulmonary diagnoses and therapy. The training program at Delgado is shorter and less elaborate; it only consists of 33 credits, which can be completed in half the time as the undergraduate degree (two years). Also, the program has a more toned ultrasound focus, with specialization in OB/GYN and abdominal. The P.A.C. program at DCC is designed for people who already have an associate degree, or have at least 60 credits worth of college coursework. Although both programs have clinical practicums for promoting hands-on experience from a simulated workplace, the LSU program offers five units while the one at DCC has four. According to a report by the U.S. Bureau of Labor Statistics (BLS), diagnostic medical sonographers in Louisiana had a median yearly income of $55,600 ($26.71/hour). That year the bottom 10 percent were able to make a median annual salary of $40,300 ($19.37/hour). On the other side of the spectrum, the top 10 percent earners in the Louisiana sonography workforce had a median yearly wage of $75,300 ($36.22/hour). There were 800 diagnostic medical sonographers in Louisiana, a number that the BLS expects to grow by 35 percent by 2020.